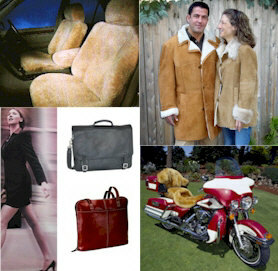 Shearling coats, sheepskin jackets, vests, sheepskin seat covers at factory outlet prices. Shearling coats for ladies and men, furs, leather and shearling vests, sheepskin slippers, sheepskin seat covers, hats, mittens, gloves are just some of the items we make to keep you cozy and warm on the coldest winter days. Check out our new line of sheepskin motorcycle seat covers too. Also, look over our collection of top quality bags by Latico Leathers, including leather purses, leather backpacks, leather briefcases and leather duffel bags. If you're look for beautiful Shearling coats or something warm for yourself, we have plenty of items that you're sure to love. Check out our warm beautiful Shearling coats, sheepskin jackets and stylish luxurious furs and all the other great items we have to offer. We have leather jackets and vests, leather backpacks, leather purses, leather briefcases and duffel bags, sheepskin slippers and skuffies, sheepskin boots, hats, mittens, deerskin gloves, area rugs and many other items. If you need something custom made to fit your size, we can do that too. Just use our online measurement forms and guides and you can submit your order to us electronically on our secure servers, or print out the forms and fax or mail them to us. All your online sensitive information is encrypted and %100 safe, so you don't have to worry about security when ordering online. We can also custom make top quality sheepskin seat covers for your car or truck seats. We have thousands of patterns for all makes and models of cars and trucks, so we can definitely make a cover to fit your vehicle. In addition, we have pre-made sheepskin seat covers, that are beautiful Australian Merino and fit most seats, if you're looking for something that's a little more economical but don't want to sacrifice quality. Also, we make sheepskin motor home seat covers and sheepskin motorcycle seat covers. Basically, we can make sheepskin seat covers for any vehicle, including airplanes and golf carts, if you provide us with the measurements. Just ask us to email a measurement form to you. While your here, check out our selection of ladies beautiful luxurious Mink and Beaver furs. We have both full length and jackets. From our full length mink or beaver to a reversible mink and leather jacket, you can find a look that's right for you. Our furs are crafted with the finest materials and are sure to give you years of warmth and luxury. In addition to our shearling coats and sheepskin accessories and sheepskin seat covers, look over our great selection of Latico leather bags. For over 20 years, Latico Leathers has pursued a simple and straightforward approach to our business: we offer a line of reasonably priced top grain leather bags and accessories that combine innovative design, top-quality hardware, closures, and linings, and superior workmanship. We have earned a reputation for designing, developing, and manufacturing leather goods that are creative and classic, stylish and casual, elegant and affordable. Our products appeal to men and women of all ages for both business and leisure pursuits and include leather purses, leather briefcases, leather backpack and leather duffel bags. Our family has been making shearling coats and has been in the sheepskin and leather business for over 45 years, manufacturing most of our own products. All our sheepskin products are guaranteed against defective workmanship and materials for the life of the product. If you have any problems with them, simply return them to us and we'll make the necessary repairs at no cost to you. From Berks County PA in the Oley Valley, we bring you a selection of unique items and gifts, many of which our family has been making for over thirty five years. VillageShop.com is located in a small village called Pleasantville in the township of Oley, which is about 1:15 minutes north of Philadelphia, 20 minutes east of Reading on Route 73 and 30 west of Allentown.